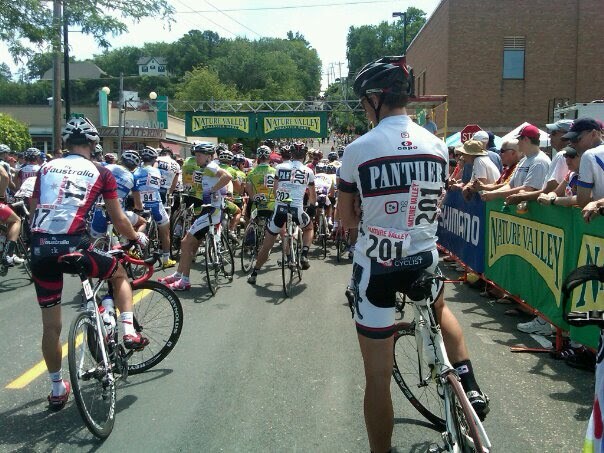 Sunday was the final day of the Nature Valley Grand Prix, the infamous Stillwater Criterium. At 1.4 miles some promoters might consider this a very long circuit race and not give free laps…..MELON CITY…..but fortunately they DID give free laps which helped my race immensely. We packed up all out belongings from our very awesome host housing/race support/local guide/general cool guy Kevin Schaeffer and headed out to Stillwater, which is a half hour east of the twin cities and on the way home. 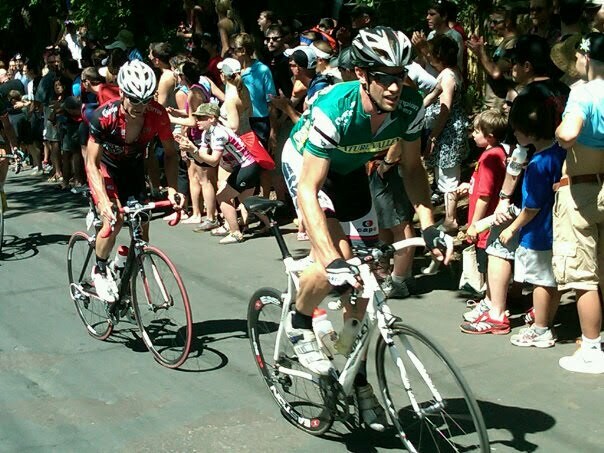 First of all, the NatureValley race likes to pride itself on owning America’s HARDEST criterium of all time end all be all, they think of it like the final sword duel in Highlander. It is by far NOT the hardest crit, which is a pretty hard metric to measure. The course starts off at the bottom of THE hill, which is a less than quarter mile pitch that ramps up around 20%. The course then hangs quick left followed by a right hander to ascend further up a false flat. 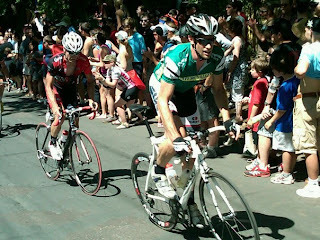 Two more right-handers send the riders down the long descent towards the start with a few turns but nothing technical. If you’re curious why it isn’t the hardest crit let me give some examples. First example: Snake Alley, MUCH harder course with a very technical climb and technical downhill. 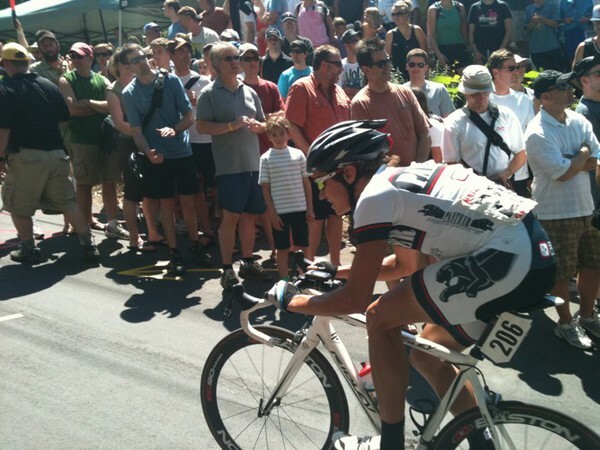 Second: The Joe Martin final crit, much bigger hill (but not technical), and very dangerous/technical downhill. That being said, this crit had probably the most and loudest spectators of any race I’ve personally been in. People lined the hill several deep, creeping into the road, making you feel like your riding in Le Tour as you grind up the hill in your 39×25. It was an amazing experience. As with any technical crit, the most of the bumping came as riders lined up at the start line while the announcers called up 20 some riders. I somehow managed to roll up to the start from the wrong direction and was in the last row, which turned out to be the best thing since sliced bread. The announcer counted down, and the race was off with enough nervous riding to cause a crash in the first 10 meters, which is exactly what happened. Two riders ahead of me, two guys tangled and went down, I did a sort of summersault and ended up on top of two other guys. I couldn’t get myself untangled from my bike and other riders until someone simply picked me up around my middle and pulled me off the pile. After checking the bike I lined up along the barricades with the 20 some riders taking their free lap preparing to jump back in. When the field came around the ref waved us in, AT THE FRONT! By the time I got up to speed, which is pretty slow on a 20% grade, I was a mere 30 riders back. I wouldn’t say it was smooth sailing from then on, but being in the field ahead of the vortex of riders dropping off the back helped immensely, I was able to recover on the descent and even move up in the corners. 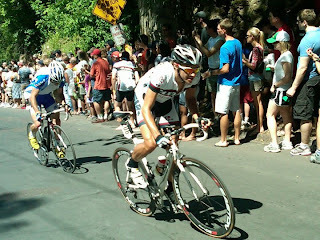 I saw Paul and Ryan both several times looking good in the field. However my good luck was not to last long, with 5 to go Jamis got to the front and really started turning the screws on the false flat after the hill, which was normally pretty tame earlier in the race. Because of this the next time up the hill I was gapped and that was pretty much all she wrote. I rode in with a few other amateur guys, and did the final trip up the hill in the big ring…just for good measure (the finish was at the top of the hill). The course did do quite a number on the field though. Of the 130 some riders that started the race, 15 or so did not make the time cut (completing 5 laps without being lapped by field) and less than 50 managed to complete the full 20 laps. I managed to slot in 34th, a mere 2 minutes behind the leaders, which catapulted me from the 80’s in the GC to 53rd! aul lost the Amateur jersey to Chris Winn of team Rio Grand, who had a great ride, and Dan was the only other Panther to finish the 20 laps. After grabbing some showers at the local sports club and some Mexican food we headed back to our neck of the woods. Sweet ride! Can’t wait to see it when they show it on TV this weekend.